Total: 1 hr | Active: 25 Min. Cover and cook the leeks briefly in a little salted boiling water until soft. Drain, and place half in a greased, wide, ovenproof dish. Mix the ham and grated cheese, spread half over the leeks. 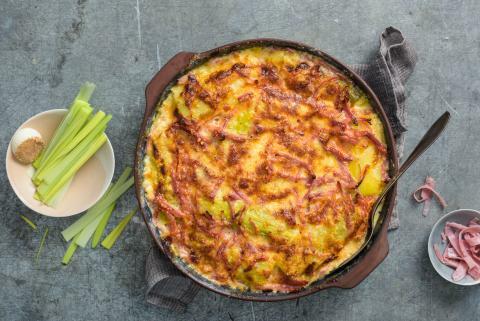 Place the rest of the leeks on top, then scatter over the remaining ham and cheese. Mix the seasoning into the cream and pour over the gratin. Gratinate for approx. 35 mins. in the centre of an oven preheated to 200°C. Boiled potatoes in their skins.